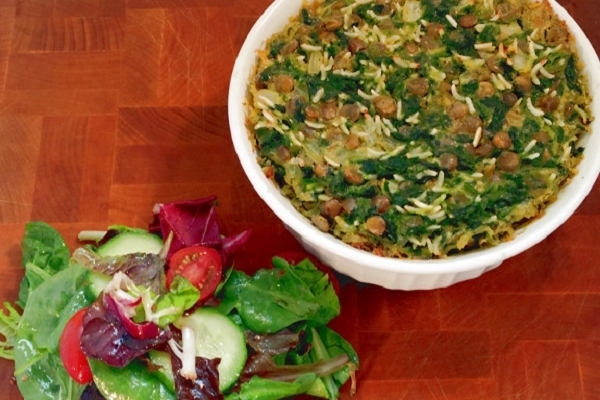 Spinach, brown lentils, basmati rice and onions pulled together with a coconut milk base to make a palate pleasing yet healthy vegetarian dinner. Served with a mixed green toasted cumin salad. Preheat oven to 350F. In a pan, boil coconut milk. Add vegetable mixture, lentils and rice stirring well. Pour into provided pan. Bake for 30 minutes. Pour salad dressing over mixed greens, mix and serve together with casserole. 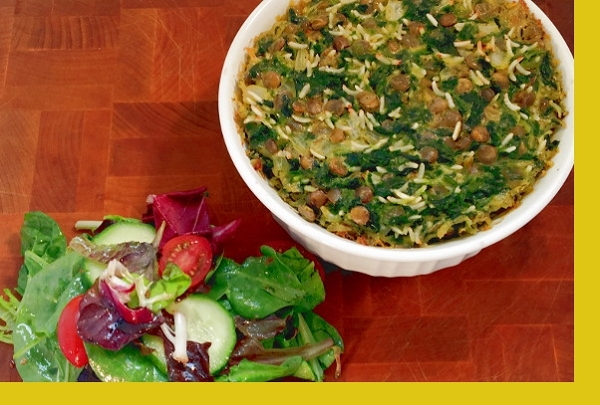 I loved the spinach lentil casserole. Downright delicious y'all. Very filling and satisfying. Would you please consider making this one of your standard dinners? It's that good. Please try some more lentil or pea combinations. Full of rich flavor and easy to prepare. Anxious to taste this dish, I was extremely pleased! The textures and flavors tantalized the palate and satisfied the appetite. Very generous portions, too, which was great as I had to have seconds. Easy to prepare, it's now one of my favorite dishes.